Outwardly, Malini is a contented, sixty-something grandmother with a loving family and everything a person could wish for. But Malini has lived her entire life with a secret confined to the deepest recesses of her heart. Haunted by the past, she travels toKumbakonam, her native town, which she had left years ago. There, she comes face-to-face with her long-lost love. After forty years, willMalini be able to reclaim her own life, when love comes knocking at her door once again? Full Circle is a beautiful story of finding your true love. It’s a tale of Malini, a grandmother and a widow who goes in search of answers to her long lost love. She is a 60-something woman, who stays with his son and family and is content of the life she lives. But why the urge of going against her family’s wishes and stay at a retirement home in her home town? Will she be able to succeed in her quest of finding answers to the secrets she kept hidden in her heart for ages? This is a beautiful story with intense emotions. It is well-written and is a thoroughly enjoyable read. There is a lot of positivism, sibling love, family values and traditions and a sublime and classy romance. The writing style and narration is impeccable and the story ends in a very bold note. 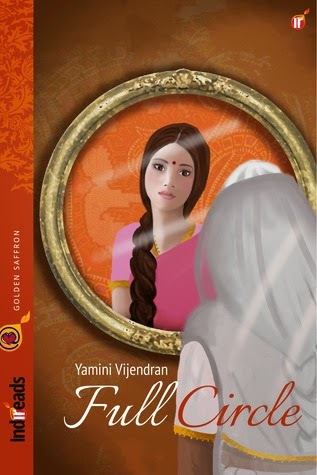 The book cover is pleasant and different portraying both the younger and older self of Malini. But being a South Indian, I did have a thought on why she is having a pallu on her head. Sincere appreciation all the way to Yamini on her maiden voyage.